High CPC keywords for website:- Today Rock programmer provide the post how to find high CPC keyword for free of cost. CPC are Cost Per Click. If you want to earn money from google ad-sense then you need to first of all high (CPC) Keyword in your blogger website.because your site traffic increase and more money earn money. Today i will talk to about free method for high CPC keyword. Many bloggers always spoken , my blogger traffic is increasing, but i am not earn more money from google adsense. 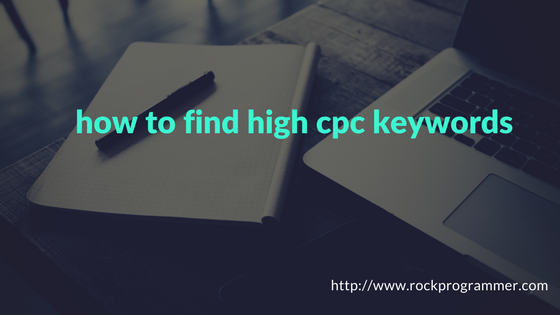 So i am going to share knowledge, How to getting high cpc keyword. First of all you install the Keyword Everywhere extension install the chrome browser. After install extension you need to Api key. then fill the email_id and you can go to the mail id and open the mail and copy Api key then past in Keyword Everywhere extension. Send the API key your mail_id, so you open the mail_id and copy the API key. So, Copy this key and past in keyword research tool then after past key click on Validate. After verify tool, you go to the ezinearticles.com site and select the category regarding to your site articles.and copy categories from site and past bulk upload keyword. then click on submit button. Finally find the high cpc keyword.